Try to imagine, if you will, what it must have been like for volunteer fireman Bill Schempp and Assistant Fire Chief Russell Davis during those dark, smoggy, suffocating days and nights of late October 1948. Both men worked day and night to bring oxygen and other assistance to Donorans who had become sick from the smog. That Friday night, October 29, after watching the annual Halloween parade with his wife, Schempp received a call at home from Fire Chief John Volk that he needed to bring oxygen to ailing Donorans. Schempp threw on his heavy, brown turnout coat, clipped the stainless steel buckles closed, slid his feet into a pair of black rubber boots, and snugged his DFD helmet onto his head. He strapped on the oxygen tank he kept at home, the green one, labeled TO BE FILLED WITH COMPRESSED OXYGEN ONLY, and walked out the back door, onto Thompson Avenue, into the dark fog. Walking had become so difficult by then that he dropped to his hands and knees and crept through the heavy, burning fog, feeling his way from house to house. Once inside he gave oxygen to the people who needed it most. Chief Volk would radio Schempp new homes to visit, based on the calls he received at the station. Each visit lasted only a few minutes. Schempp would fit a thick rubber mask over the ailing person’s nose and mouth and turn the oxygen on for 10 or 15 seconds, delivering what he called a “shot of oxygen.” Sometimes he gave one or two shots, rarely three, over a period of five or ten minutes. Just as the person began to breathe more easily, Schempp would shut the oxygen off, remove the mask, and move to the next house, to the next person clamoring for help. There were so many people to help, he was afraid the oxygen in his tank would run out. And so it was that Schempp and Davis, men who had fought fires and transported the sick and injured to local hospitals, men who had comforted those who had lost their home or loved ones, were forced to decide how much oxygen to give each of their neighbors desperate for air. They had to say over and over, No, I’m sorry. I have to go. They had to listen to critically ill people and their loved ones plead with them, begging for more oxygen, and then walk away, knowing they might never see those friends alive again. Imagine the torment they must have felt, the guilt, the overwhelming sadness of being essentially helpless in an unfathomable tragedy that, in the end, claimed at least 19 lives over that weekend and hundreds, probably thousands, over the coming months and years. 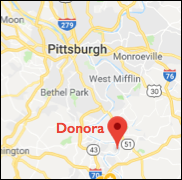 The physicians of Donora didn’t fare much better. They, too, clamored throughout Donora, doing whatever they could to help their patients. Drs. William Rongaus, Edward Roth, Martin Hannigan, Sr, and Ralph Koehler, among others, all made house calls throughout town that weekend. They injected adrenalin into patients suffering from asthma and used whatever other medicines they carried until they, too, fell ill from the smog. Koehler had to stop visiting homes at 1:00 AM that Friday night, so sick from the fog was he. “I had to go home,” he said. “God knows I didn’t want to, but my heart gave out. I couldn’t go on any longer without some rest.” He was days away from his 49th birthday and would die from a heart attack less than ten years later. How many victims those caring souls saved cannot be known with any certainty, but surely the number must run into the dozens, maybe hundreds. In the kind of noxious conditions Donorans found themselves that October, even momentary relief from a shot of oxygen or adrenaline might well have been enough to survive until Sunday, when rain came to break up the fog. Imagine the pride that Schempp, Davis, Koehler, and the others must have felt when they realized that the vast majority of the people they aided had survived the weekend. They might never have bragged about it—and in fact I have found no evidence to suggest that any of them ever did—they surely felt the kind of deep, warm gratification that can come only from saving a life. They would have felt honored to have been there to help and grateful that their skills alleviated suffering at such a perilous time. Those are the kinds of feelings the men would have carried to their dying day. Where did you get the picture of the oxygen tank from?